The famous Philly Cheesesteak gets a delicious and fun Italian update! 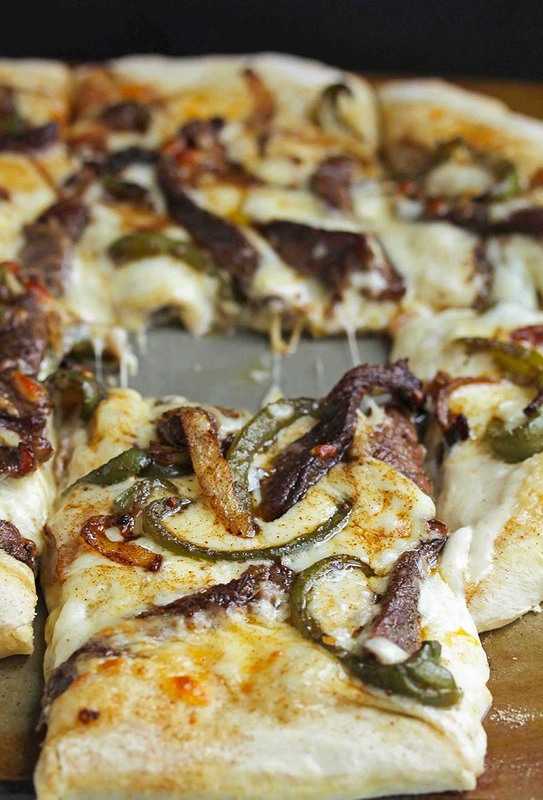 This will become your new favorite on pizza nights! In a medium sized bowl, add flour, garlic salt, sugar, yeast. Using a dough whisk or wooden spoon, slowly add in water. Mix together until ingredients are combined. Turn dough out onto a floured surface. Using your hands, knead for a few minutes until dough is smooth and elastic. Shape dough into a ball. Spread 1 tablespoon of olive oil in a separate bowl and transfer pizza dough to that bowl. Cover with a towel for 1 hour. In a medium sized sauce pan over medium high heat, add steak strips, minced garlic, onions and bell peppers and stir together. Add in Worcestershire sauce and season with salt and pepper to taste. Continue to sauté the steak and vegetables until steak is well done and both steak and vegetables are golden and tender. Roll pizza dough out and place on pizza pan. Spoon Alfredo sauce over the surface of your pizza dough. Next top with a few sheets of provolone cheese. Sprinkle the steak mixture over the provolone cheese and top with any remaining provolone cheese. Lastly sprinkle entire pizza with a bit of paprika. Bake for 12-14 minutes or until crust has turned golden brown and cheese has browned and is completely melted. Recipe created by Grandbaby Cakes.